Be honest. Your perception of a Mercedes-Benz is probably much like everyone else's; a large, luxurious saloon, ideal for cruising, continental blasting and parking at the local golf club. If you're looking for a used example, that's probably what you have in mind. Fair enough, as long as you remember that Mercedes-Benz is also purveyor of some of the world's finest - and fastest - sports and specialist models, the swiftest of which are tuned by German specialists AMG. A few E-Class and SL models have made it to the UK complete with the AMG touch but the majority of used AMG Mercedes models tend to be the C-Class-based C36, a car replaced in February 1998 by the quicker C43. Both offer all the traditional Mercedes-Benz values as standard but have an added touch of mature exuberance. Put simply, chameleon-like qualities come as standard. To change from sober suit to sports jacket, simply put your foot down. 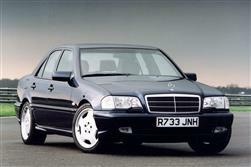 The potent AMG C36 was introduced in July 1994 as flagship of the successful C-Class range. Unlike its C-Class stablemates, it was offered only in one pricey but complete package, including standard automatic gearbox, classy AMG alloy wheels, skirts and spoilers bodykit plus a complete specification. Numbers were limited. A five-speed automatic gearbox and standard cruise control were added in August 1996 and the car was eventually run out with the C-class facelift in the summer of 1997. Mercedes super saloon fans then had to wait until the following year for the introduction of its replacement, the 4.3-litre V8-powered C43, which included all the refinements of the updated C-Class range. This car was also offered in estate form, a version which continued for six months when the saloon range was phased out in autumn 2000. Equipment levels include just about everything - as you'd expect for the money. Power steering, central locking, retractable rear head restraints, anti-lock brakes, twin airbags, AMG alloy wheels plus, on later models, cruise control - and the list goes on. Every example started its life at the Mercedes factory in Sindelfingen but from then on, the input came exclusively from AMG. Visually, the clearest evidence was the purposeful body kit, though from a technical point of view, the underbody changes were far more significant. A franchised dealer service history is absolutely essential. Check that all the accessories work - particularly air conditioning, which is expensive to put right. Cosmetic damage can be expensive to correct too. Watch out for signs of wheel kerbing and accident damage. Ask too whether the exhaust system is Mercedes' own (a pricey AMG-tuned package); non Mercedes systems are noisier. Leather upholstery blemishes are pricey to repair. (approx, based on a 1995 3.6 saloon) Allow around £250 for a full clutch assembly and about £3,000 (!) for a complete AMG exhaust system. It will cost in the region of £180 for a radiator, around £140 for a starter motor and from £300 for an alternator. Brake pads can be up to £55 for the front and £20 for the rear, and a replacement headlamp is about £550. If an ordinary C280 could be described as the Purdey shotgun of the automotive world, its AMG stablemates, the C36 and C43, had to be more akin to pump-action shotguns. Immaculately presented and well-oiled devices to be sure, but fearsome weapons nonetheless; perhaps that's why buyers loved them. When you drove the cars, it was frightening to imagine what could happen were either of these disciplined road racers to have fallen into the wrong hands. Perhaps it was just as well that the asking price made that unlikely - as did Mercedes' policy of importing extremely limited numbers of these executive expresses. That said, the AMG Cs had more in their repertoire than simply sheer power. To be sure, there was a ferocious snarl when you activated the ignition and blipped the throttle, but the over riding exhaust note was deep and rich, like a race car gone to elocution lessons. On the move, the story was much the same. You planted your right foot and waited for three hundred or so braked horses to burst for freedom, rushing the aggressively styled fiery four-doors to sixty in six seconds or even less. Yet the power delivery from the six-cylinder and V8 motors was so even and smooth that you were not aware of breaking the speed limit until well into license confiscation territory. To satisfy the German environmentalists, the engines were electronically restrained from going quicker than 155mph. Slick shifts from the standard automatic gearboxes however, meant that you were treated to an almost uninterrupted torrent of thrust. The steering and handling were almost as impressive. Indeed, the response from the leather-covered sports steering wheel has been described as "kart-like", a reference to the fact that the Cs could be manoeuvred with a directness that made them feel smaller and more wieldy than they really were. As for the grip - well, you could turn your hair grey trying to find where it ran out. Huge tyres meant that unless the corner was really tight and you could use the power to unstick them, they clung on, usually until you lost your nerve and backed off. AMG set the suspension to reflect their belief that it wasn't necessary to feel every bump and ripple of the road in order to keep in touch with the tarmac. So it was that these king compacts could double as a devastatingly effective long distance luxury expresses when the need arose. However, the AMG Cs were always at their best on twisting secondaries, where they dispensed with persistent GTis much as you would swat an irritating fly. A safe, solid investment with a touch of sporting spice.